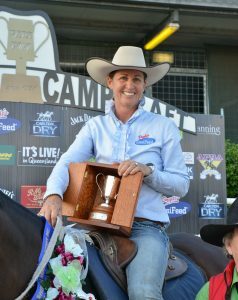 Vicki has grown up in a campdraft family and has at her disposal a wealth of knowledge BUT don’t underestimate her tenacity and desire to cut her own path. She has amassed 15 GCA lady rider titles and in 2016 won her second Grandmother Clock and then backed it up with a win in the ladies at Warwick. She has a great team of horses. Vicki’s program revolves around identifying horses that have the desire to work cattle; A characteristic she seeks to support and enhance throughout their development. If you like a ‘get the job done’ attitude in your horses we’re sure you will benefit from Vicki’s advice.